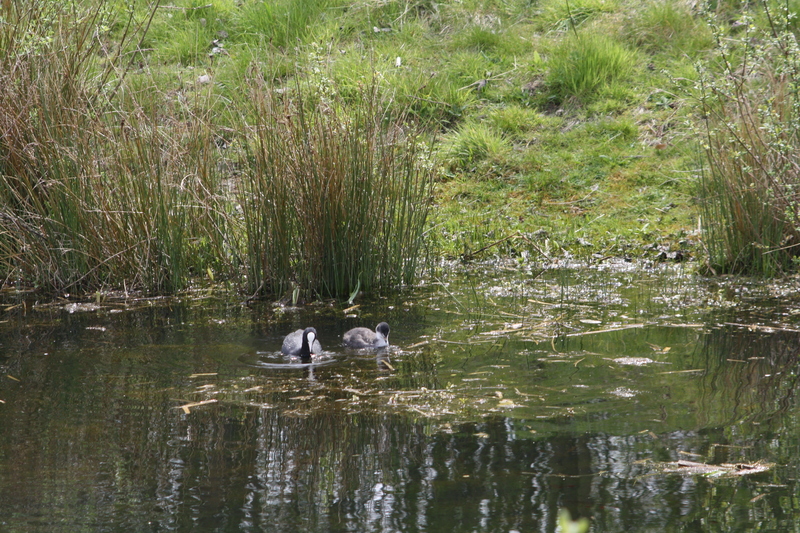 This spring, I was delighted to see baby coots at Reffley Reservoir. They appeared out of the reeds with their parents at the last moment, just as we were about to give up on our quest to see them! 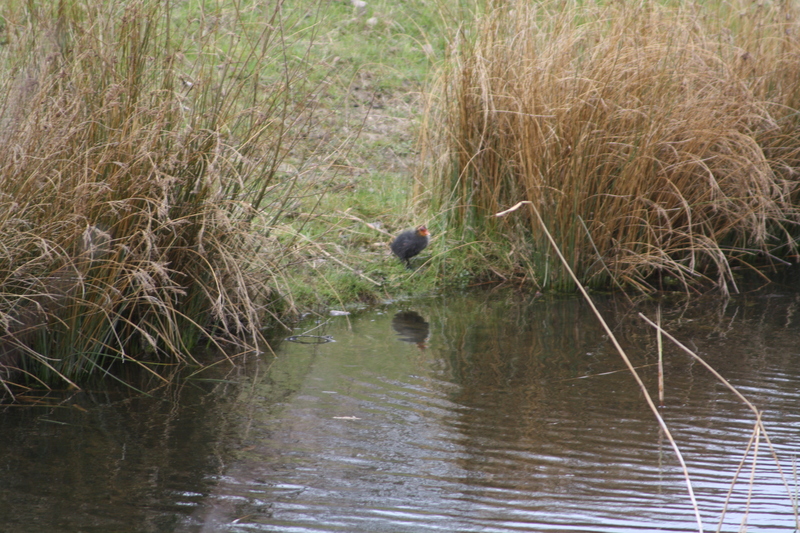 There were four of them – little black bundles with quite a lot of red on their heads, perhaps a little bit more than I’ve noticed on the young of moorhens to whom they are related. We enjoyed several moments watching them swim around with and being fed by their parents. That was on April 10th. It is possible to see the fuzzy red and yellow hair on the babies’ heads. 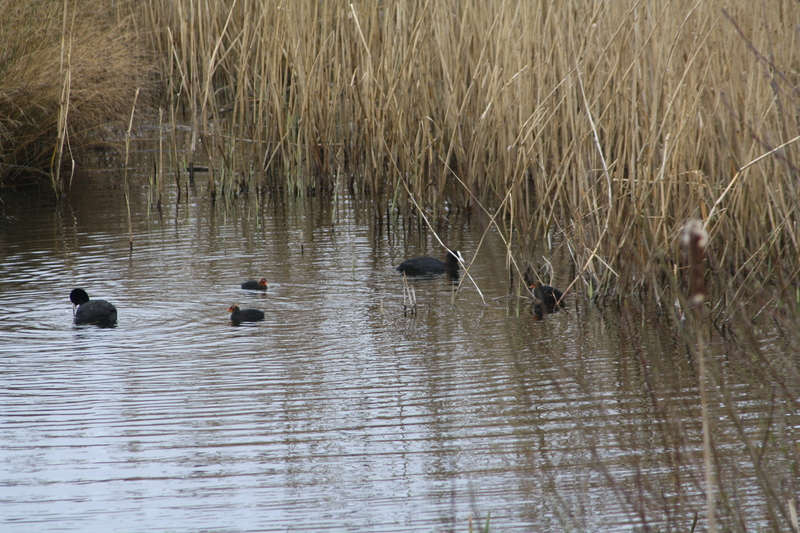 Two more adult coots were in another part of the reservoir that afternoon. I unfortunately didn’t manage to return to the Reservoir for nearly another month, but had occasional updates from my daughter. She mentioned having watched them being given lessons in diving by the adults, but said the youngsters didn’t seem too keen. 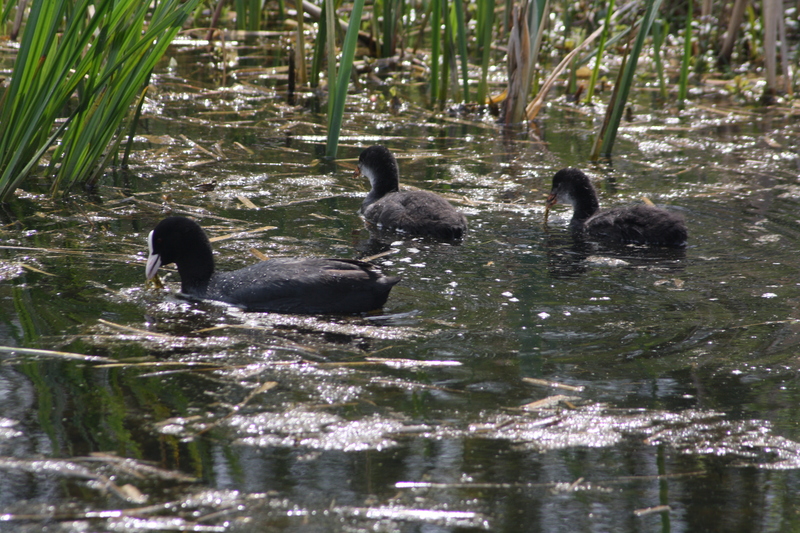 On May 6th, we cycled to the reservoir to see how the young coots were doing. Again we had to be patient as they took a while to appear, but eventually, four juveniles and two adults swam into view from various directions. One juvenile did dive down into the water to look for food. Nearly a month later, the babies have grown considerably. Last year, I saw coots at the reservoir for the first time. It seems they like the site! 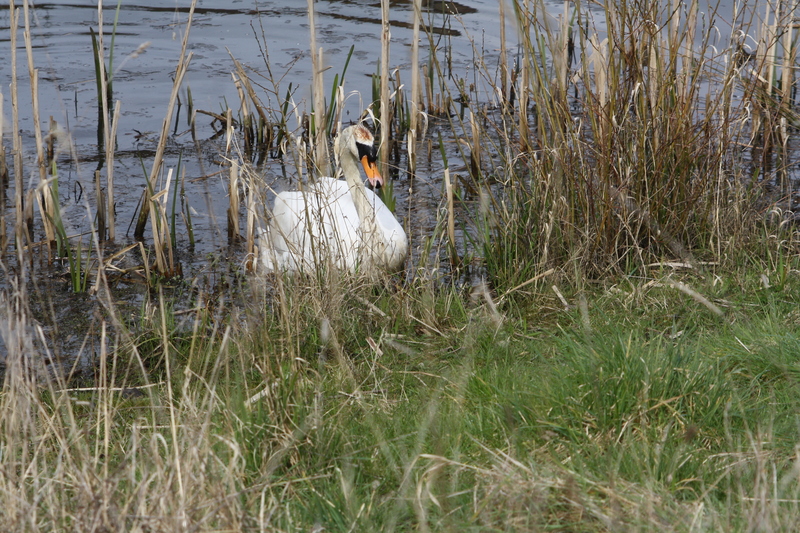 There are a pair of mute swans at the reservoir again this breeding season. I saw them for the first time on April 8th. Then again on April 10th, and twice in May. Estimates of the number of eggs the female has laid this year starts at four. Last year, they produced eight young! The male swan keeps an eye on us. 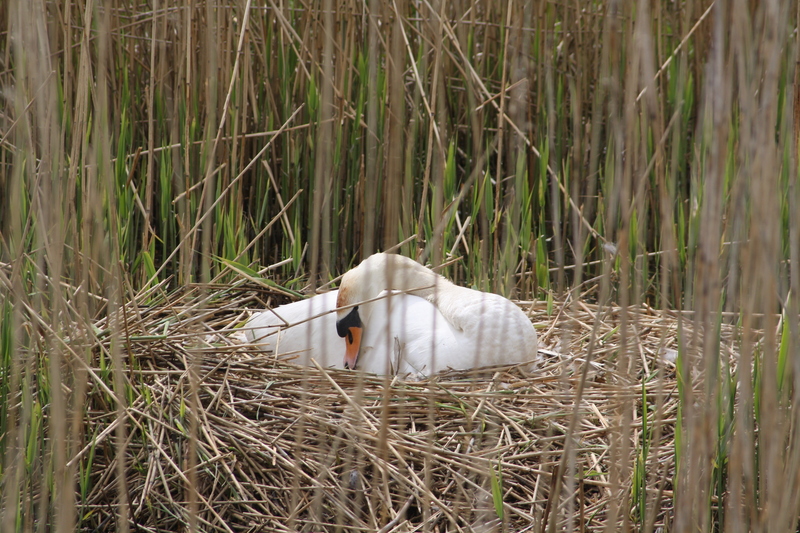 The swan couple at their nest. 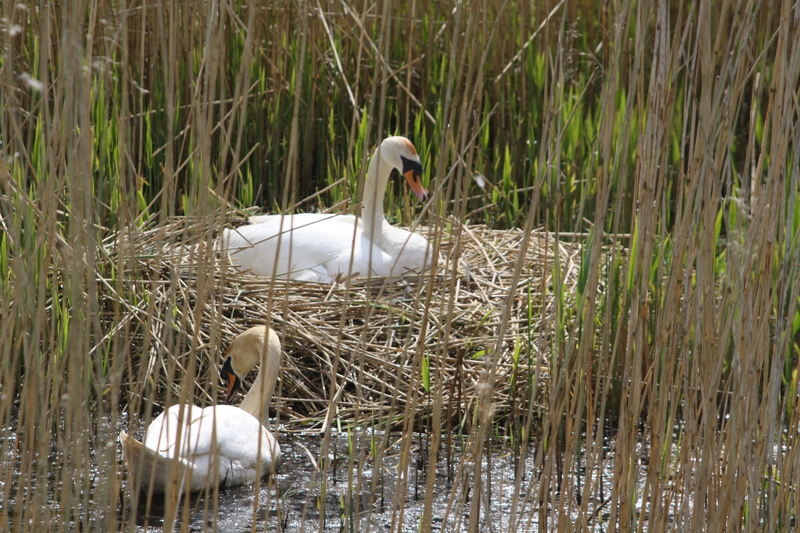 The female swan rearranges her nest. 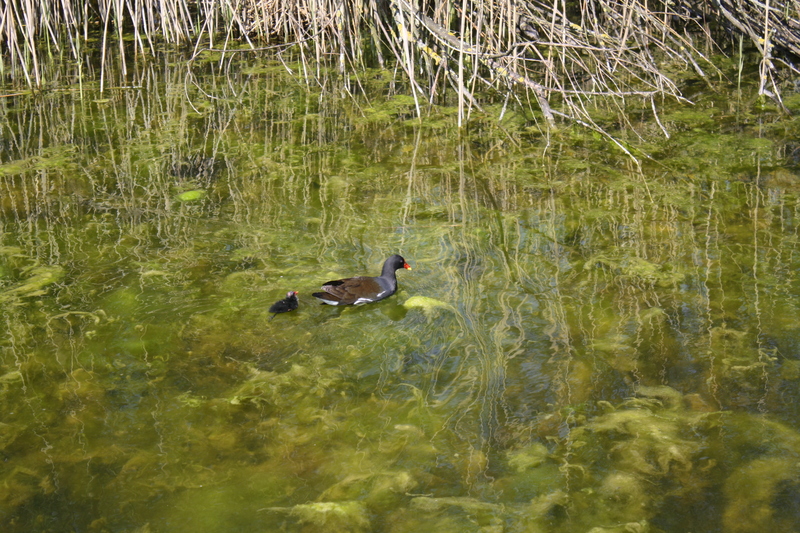 Meanwhile, as I’m on the subject of water bird families, the moorhens have already had their second brood for this year. They seem to prefer the pond near to Reffley Spring Wood for raising their families – that’s the only place I’ve seen young ones, although there are adult moorhens at the reservoir. They seem shyer than their fellow rails, the coots, preferring to keep to the edges of the reservoir or to remain amongst the reeds. As usual, the ” teenagers” from the first batch are still around, helping with their younger siblings.